After living at the University for two and a half years without an ice cream shop in walking distance, I have finally found an answer to my prayers. 0Degree Thai Ice Cream, a new shop on Main Street, brings the trend of Thai rolled ice cream to Middletown. A phenomenon sweeping the country, Thai rolled ice cream has been popping up in stores and drawing big crowds. 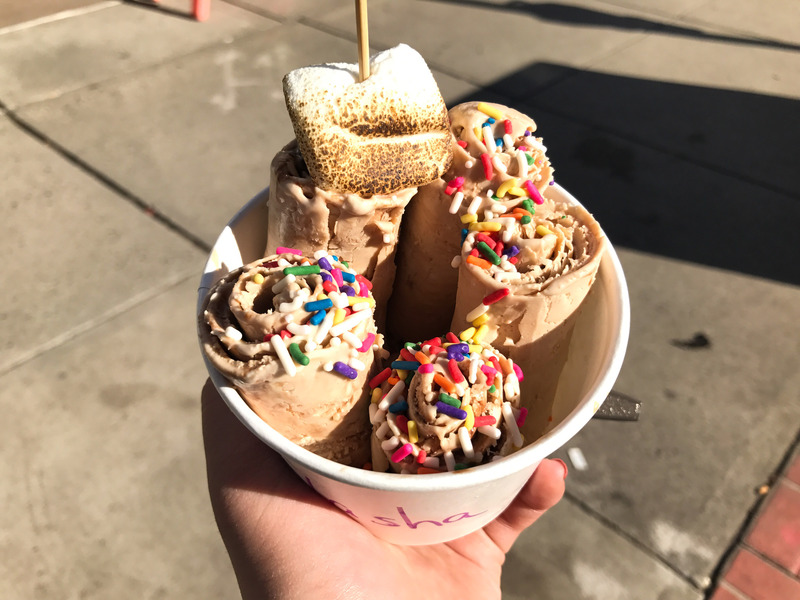 The ice cream comes in several rolls all packed into a cup with your choice of unlimited toppings, and, although it has existed throughout Southeast Asia for a while, it’s the latest food trend in the United States. When I went to 0Degree this President’s Day afternoon, the store was packed with children, families, and other Wesleyan students. I arrived just in time—behind me, the line went out the door. Upon entering the store, there is a large blackboard on the wall detailing your ice cream options, all at $7, and, as a marshmallow fanatic, I chose the S’mores Galore. 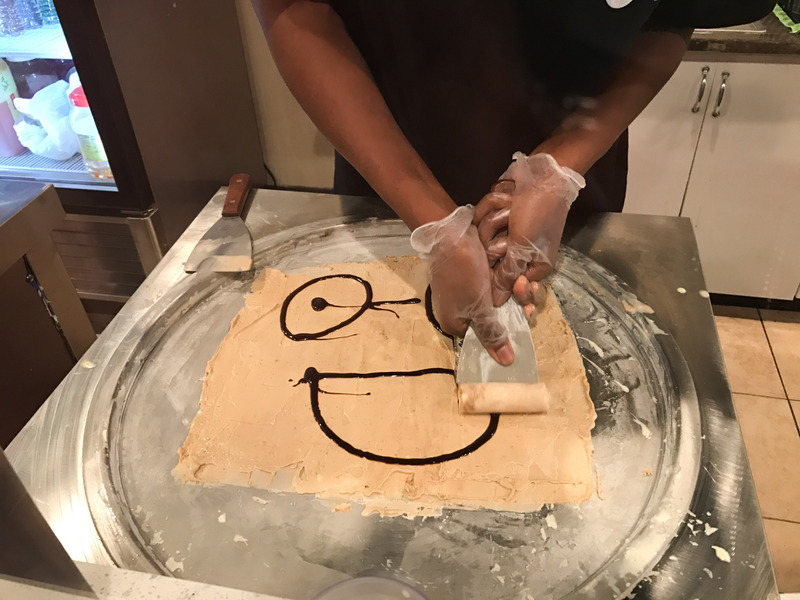 Once the super-friendly ice cream staff has taken your name, you wait for your turn. The staff calls each customer up one by one to watch the employees create each individual ice cream. For a relatively small, busy store, they churn out ice cream quickly, and after only a short wait, it was my turn. It takes a couple of minutes to make the ice cream. The staff pours a milk-based liquid onto a large, circular, cold plate, which resembles one of the pans on which crêpes are made. The plate is kept at an extremely low temperature, referenced in the name of the shop. In my case, the liquid was mixed with graham crackers and chocolate syrup in order to form my S’mores Galore base. Depending on your preference, you can mix in other options such as fruit, Oreos, or whatever else your heart desires. As the cold plate freezes the liquid, the staff mixes and manipulates the mixture with two small paddles and then spreads it out onto the pan. After spreading the mixture into a square, my ice cream maker draws a smiley face onto the ice cream with chocolate sauce. Another artistic piece that my friend received was a chocolate syrup whale. After this step, the ice cream maker pushes the paddles across the ice cream, rolls it, and places it into a cup. At this point, I was both excited and amused. Next came the best part: toppings. Despite the fact that the ice cream is a little pricey, it does come with unlimited toppings, including—to a name only a few—chocolate chips, crackers, nuts, and sprinkles. I chose sprinkles and a toasted marshmallow. Finally receiving my ice cream, I quickly left the store, which, at this point, had become a large bustle of noise and movement, with children running around and a large group of people entering at the same time. After snapping a few mandatory pictures, I dug in. The ice cream itself was tasty and sweet, but not too sweet; I definitely wasn’t tired of eating it after finishing the whole cup. What really struck me about the ice cream was its creaminess, almost matching that of gelato. Further, the store was very generous with its use of toppings, as both the base liquid was mixed with chocolate syrup, and more syrup was drizzled on the ice cream itself. Main Street also lacks a proper bubble tea shop, and 0Degree fills this void by serving multiple types and flavors of the classic favorite. The bubble tea was a little too sweet for my taste, but it was prepared by a mechanical shaker, which was an interesting, fun change, as it is typically shaken by hand. The eatery adds a new flavor to the Middletown Main Street scene with its ice cream offerings, as well as by offering more legitimate bubble tea. All in all, the novelty of the ice cream makes me want to visit again, although, at $7 a pop, I’ll probably wait a little while before going back. 0Degree Thai Ice Cream is located at 312 Main St, where you can get Thai Rolled Ice Cream, bubble tea, and fruit teas.